The skeleton was under trees in the woods above Duck Skull Lake, and took ages to rot down. Even in July when I collected the skull, it still had tendons on it even thought it had been there for about three or four months. I soaked it in a bucket of water to help it to rot, then I cleaned it with hydrogen peroxide to make it white. The first thing I did was to see how old it was. 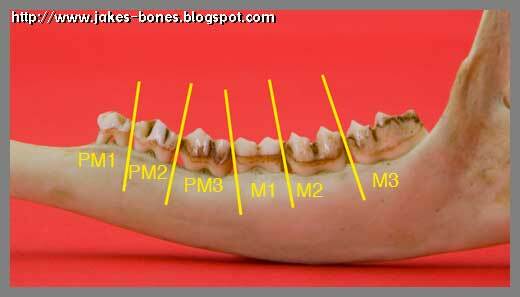 You can do this by looking at the teeth. 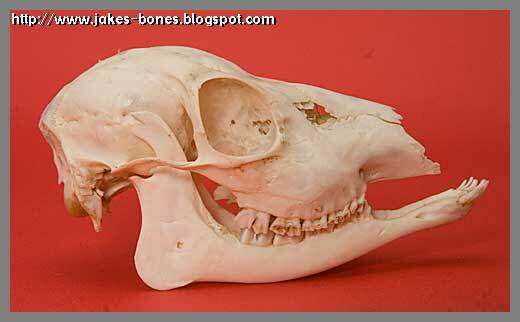 The front cheek teeth were worn down almost to the gum line, which usually means the deer was very old. But the back teeth weren't through, meaning it was young ! Deer have six cheek teeth, three pre-molars at the front and three molars at the back. 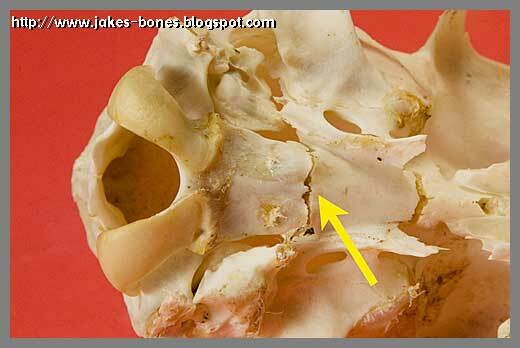 When a deer is very young, it has just the three pre-molars, then the molars come through one at a time. Then the baby teeth fall out and the adult teeth come through from underneath. 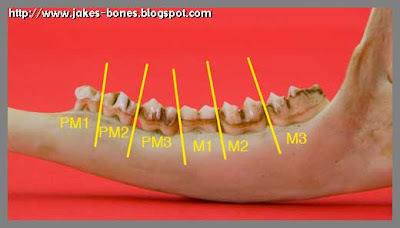 The front pre-molars were worn down because they were the baby teeth that were going to be replaced with adult teeth. You can tell this because the baby third premolar (scientists call it PM3 for pre-molar 3)is a different shape to the adult premolar. 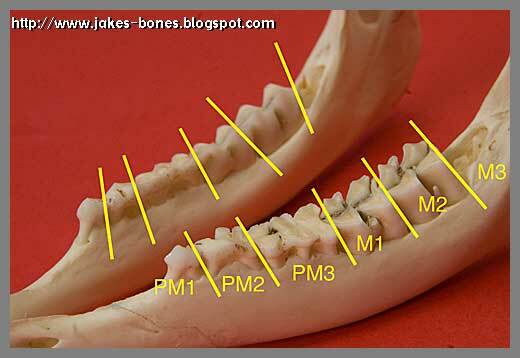 The baby one has three lumps, or cusps, and the adult tooth has two. This roe deer still had the baby pre-molars, and the back molar (scientists call it M3) hadn't yet come through. 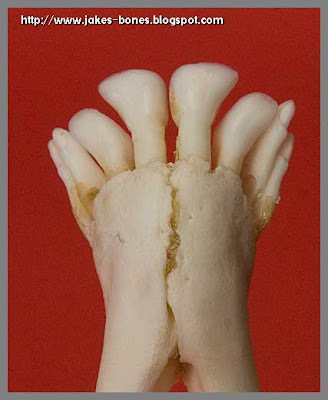 If George was 13 months and had an adult PM3 tooth, then this roe deer must be younger. 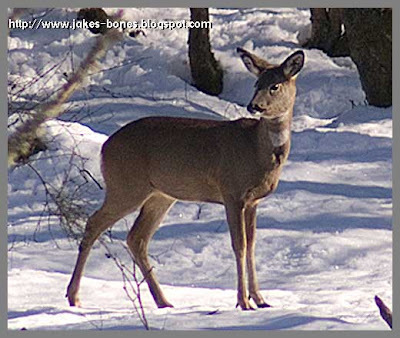 Roe deer are born in May and June, and this one died in February or March, so it must have been just eight or nine months old. There was another sign to look for as well. In baby deer, the bottom of the skull where the spine goes in is loose from the rest of the skull. On this skull, it is loose at the front but it has fused at the back. All eight baby incisors were through, and I was lucky to find them all. There was one that I very nearly missed. Being a baby deer is tough. Lots die in the cold winter, which is sad. Here are two baby deer which are about a year old which I saw in the summer. You can see their winter coat is falling off and the orange summer coat is coming through. 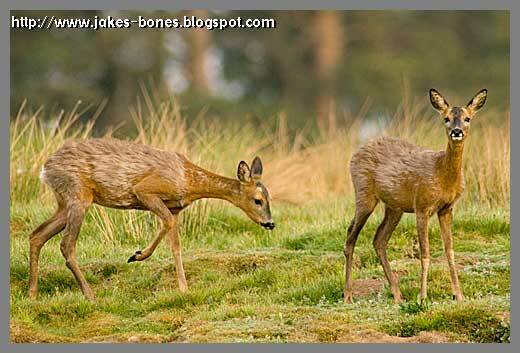 I want to write a post on here showing how different aged roe and red deer have different teeth. I have a whole box of deer jaws to help me !